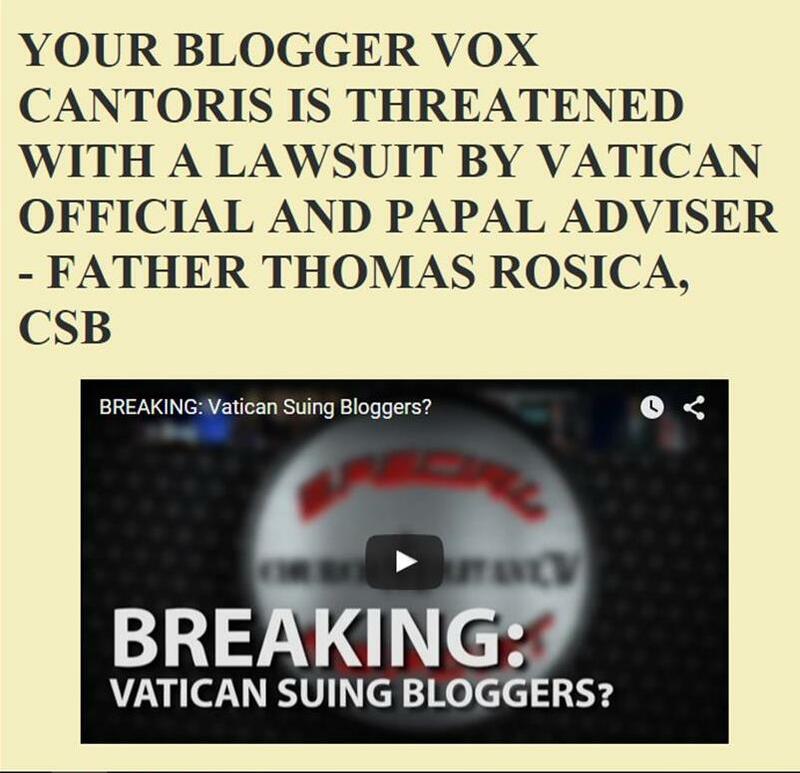 Vox Cantoris: Murray, Royal and Arroyo - telling it as it is! Murray, Royal and Arroyo - telling it as it is! Watch the whole discussion. Both Father Murray and Dr. Royal tear the document apart. Arroyo asks just the right questions. Raymond Arroyo: What do you expect the reaction to be among canonists, among bishops and how do they register the critiques that I'm hearing and the concerns to the pope in a way that could reach him and possibly reshape or read just this document. Fr. Gerald Murray: This is the effort I think all of us who are concerned want to see happen, which is to tell the pope that flattery would mean we keep our mouths closed and say nothing, but gospel frankness, remember that word he used in the Synod, “parrhesia," the gospel frankness calls upon us to say, “Holy Father either you been poorly advised or you have an incomplete conception of this issue. We know that we can share some information with you.” But the thirteen or so Cardinals (including Father Murray's Dolan and Toronto's Cardinal Collins - Vox) who wrote to the Pope at the beginning of the last Synod, I mean that’s the perfect kind of example I think is going to happen. Also you know canon 220 - all the faithful have the right to express their opinions about matters in Church life. This is good that this be debated and brought forward in the press. …St. Thomas is used in Chapter eight to justify this new approach (in the Exhortation). I can't believe that a good group of Thomists won’t be having a response to that I don't want to criticize the pope. I think the pope is a wonderful man. I think he's a holy man in so many ways. I hope to be a good man and holy myself. I don't judge, but what I will say is when you do something in public that contradicts what your predecessor did, there has to be an accounting for it and a responsibility to upholding the gospel and I think that's what many bishops, Cardinals and priests will call for. This was an excellent programme & very welcome at this time of much confusion & hurt. It is to be hoped that our Hierarchy will now fully confront the content of the footnotes to Amoris Laetitia & take on board the genuine fears of the faithful that this document could, & probably would, be used as a stepping stone to allowing habitual adulterers & sodomites receive Our Blessed Lord in Holy Communion without the need to repent & stop their behaviour. If that happens (and some say it is already happening) then a huge sacrilege takes place on top of the mortal sins themselves. Notably, it is not only deeply offensive to God but literally demonstrates that the recipient & the priest do not believe in the Real Presence & consequently we, the faithful, would have to accept that neither does Pope Francis or such an exhortation would never have come to light. To allow for such an outcome is demonic & certainly not Christlike or Catholic. It is, therefore, extremely necessary for this Papal Exhortation to be shredded. If members of the Hierarchy continue to remain silent whether in fear or complicity it is most likely we are facing a schism, as God will not be mocked. Gotta love Fr. Murray. While Royal does a careful theological tango with LA, Father Murray is Fred Astaire moving gracefully and masterfully up the walls and across the ceiling of this impossibly topsy turvy smelly mess. Thanks God, I see people like you,Murray and Royal fighting in favor of Christ. Let's be stronger. Pope Francis is causing too much confusion and error. The Gospel has been preached throughout the world and now the diciples of lucifer are preaching a counterfeit gospel to prepare the way for the antichrist. Those who have eyes to see and ears to hear, must use them now. We must familiarize ourselves with true Catholic doctrine lest we be seduced. Read the Baltimore catechism, or that of Trent. Get a Douay-Rheims bible with Haydock commentaries. We are living through the great apostasy, the great falling away; the operation of error mentioned by St Paul; the separation of the faithful from the faithless; the winnowing of the wheat from the chaff. I ask myself, do I truly know pre-Vatican II Catholicism? Do I know what Mother Church really teaches? What did my grandfather believe, or his grandfather's grandfather? They all believed what I must believe, because the Catholic Faith is immutable and never changes. False doctrine has been surreptitiously and slyly introduced for fifty years by the judeo-masons. We breath it in everywhere and the contagion enters our subconscious by osmosis. We are either with God and His Church, or we are against them - there is no inbetween. Had an unsettling dustup after the noon Mass today when Father advanced Amoris L in his sermon. He spoke of its welcome to all the unclean, how Peter was stubbornly refusing the message; he cited the re-married, and pointed his finger toward those of us who would be unwilling to listen to the Holy Spirit. As I felt the top of my head blew off, there was all I could do to keep my mouth shut until after Mass. At that point, barely able to get my thoughts together, I said that I found today's Gospel message (Jesus said: “Amen, amen, I say to you, whoever does not enter a sheepfold through the gate but climbs over elsewhere is a thief and a robber.) was, in my opinion, a good description of what the exhortation is doing, i.e., thieves and robbers climbing over elsewhere rather than entering through the gate. Before father walked away, he said I should get over myself and allow myself to hear the Holy Spirit. What's a Catholic to do? Is this my future? Do I want to confront and challenge my way through my faith? But my nature is to appease, cooperate, be seen as a good practicing Catholic. No rocking the boat. Certainly not argue with priests about what the Holy Father says! What's a Catholic to do? On the serious side, though, I have to reluctantly agree with you re RR, but he seemed to get back on track when he said that if the Church allows divorced and "remarried" Catholics to sacrilegiously receive Our Lord, then anything goes (apologies to Cole Porter and RR). Wow, you know that this papacy is going off the rails when even guests on EWTN admit that the Pope is doing harm to the Church.